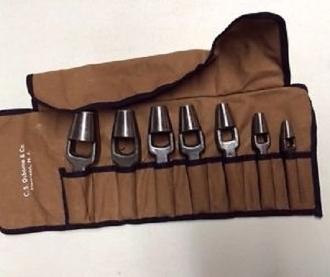 The C S Osborne K-14 seven piece arch punch set is ideal for punching clean, specifically sized holes in canvas, sails, upholstery, leather, gasket material and other similar materials. This arch punch sets include 1/4”, 3/8”, 1/2", 5/8”, 3/4", 7/8”, and 1”. Come in a sturdy, easy to use canvas tool roll.